Statue of Sir John A. Macdonald, the first Prime Minister of Canada, vandalized in Kingston, Ont, Jan 10, 2013. Police in Ontario are investigating after a Sir John A. Macdonald statue was vandalized overnight, saying it may have been politically motivated. 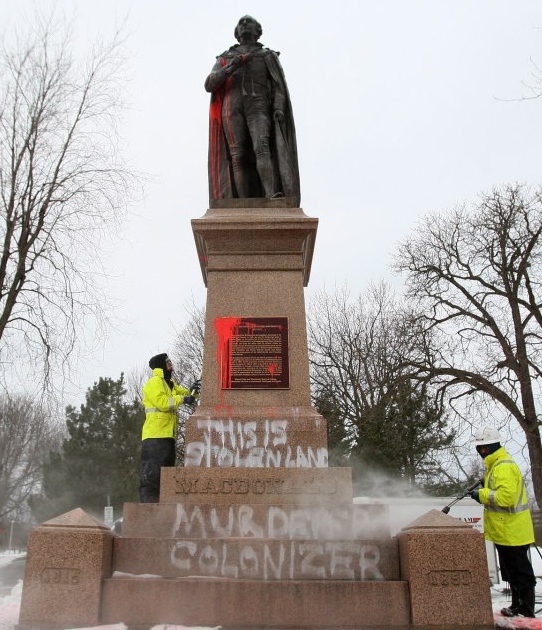 The sculpture, located in a park in Kingston, Ont., was splattered with red paint and the words “This is stolen land,” “murderer” and “colonizer” were sprayed on the statue’s base. Kingston police Constable Steve Koopman says city crews are working to clean the monument and an event at the statue site to mark the former prime minister’s 198th birthday will continue as planned. Constable Koopman says a forensics officer is on the scene gathering evidence and that police intend to speak to nearby residents for information on who attacked the statue. He says police are not ruling out a possible link with an Idle No More protest occurring in Kingston today, but that they currently have no evidence the two are connected. Constable Koopman says the defacement could be part of an effort to smear the aboriginal movement. “It would look to be a political statement but at the same time people might be seeking that for political purposes,” he said. Statue of Sir John A. Macdonald defaced in Kingston, Ont. KINGSTON, Ont. – On what would have been his 198th birthday, Sir John A. Macdonald’s statue in Kingston, Ont., has been defaced by vandals. Words including ‘this is stolen land,’ ‘colonizer,’ ‘murderer’ and ‘Sir John A. Killer’ were written on the statue’s base. Red paint was also splattered on the monument. City staff were working to clean off the paint late Friday morning. Heritage Minister James Moore was expected to hold a media event at the statue to mark John A. Macdonald’s birthday Friday. He’s expected to announce $870,000 in funding for upcoming bicentennial celebrations in 2015. “There’s no place for this kind of vandalism. All Canadians can be proud of Sir John A’s legacy,” Foreign Affairs Minister John Baird tweeted Friday morning, upon hearing of the crime. Hundreds of protests and flash mobs are planned Friday as Prime Minister Stephen Harper is slated to meet with First Nations leaders on Parliament Hill for a four-hour working meeting. Tensions have risen in recent weeks between First Nations leaders and the federal government. Kingston police Const. Steve Koopman said there is not yet reason to suggest that event, or the birthday of the prime minister, are linked. An Idle No More protest took place a few blocks from the statue on Friday but local demonstrators were disappointed by the vandalism. Posted on January 11, 2013, in Decolonization and tagged #IdleNoMore, anti-colonial resistance, Idle No More, native protests, Sir John A Macdonald, statue vandalized. Bookmark the permalink. 5 Comments. I suggest the statue be removed and something else be placed in that place that bears some Canadian Pride. But for which crime?!!! We do not need a forensics officer to gather evidence in order to KNOW who is responsible for the crime of COLONIALISM.